Bring in the winter with these scrumptious sour cherry welsh cakes. Sift the flour and baking powder into a bowl. Rub in the butter to form breadcrumbs then stir in the sugar and dried cherries. Make a well in the breadcrumb mix, add the egg and milk. Stir to form a dough. Lightly dust a work surface with flour and roll the dough to 5mm thick. Cut out rounds with a 7.5cm fluted cutter, re-roll the trimming and cut out more cakes. Place a flat griddle or a large heavy-based frying pan over a low-medium heat. Once hot, grease it with a little butter or oil. 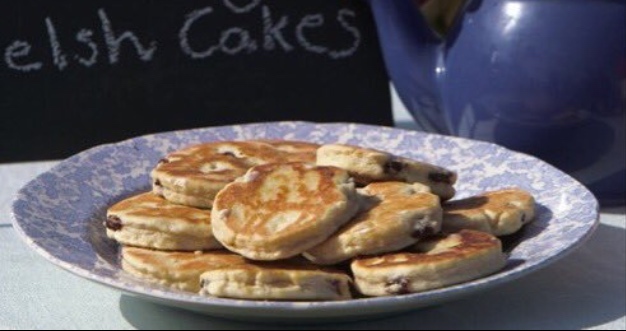 Cook the Welsh cakes, in batches, for 3–4 minutes on each side, adjusting the heat if necessary so they are golden brown on the outside and cooked right through. Remove from the griddle. Eat straight away with butter.